​Thanks for stopping by Notestine's Farm and Boulder- the only Landscape Boulder Ohio source! 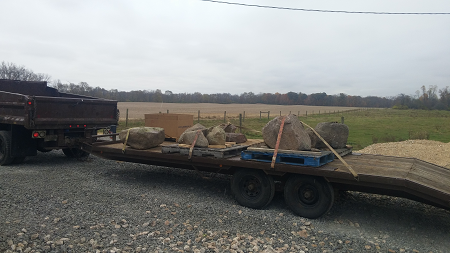 We're your best source for large boulders in the entire state of Ohio! We not only sell the big ol' boulders, but we have an awesome selection of small boulders and rocks as well. Call 937-308-3955 now to get information for your boulder! We'll supply your landscape boulder needs, but we can do so much more! We offer a full service boulder fountain service in addition to engraving your large rocks with anything you wish to the entire state of Ohio! Why are we the best? There's a few reasons: First off, our people make our business what is is. They have the expertise and high level customer service skills to ensure all our customers get what they need, when they need it. Second, we have the best equipment. We have what you need when it comes to boring your bolder for a fountain, engraving your last name on your huge rock, or placing your large stone in place with our crane. Third, our material- aka big ol' rocks, boulders, stones- are primo. No need to look anywhere else in O-H-I-O. 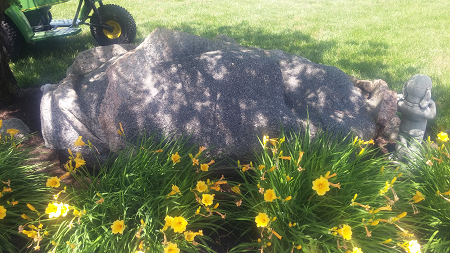 ​What can be done with landscape boulders? Accent your already beautiful landscape as a centerpiece or focal point of sorts. Have you already optimized the landscape around your house or business? If so I'm guessing it looks fantastic and you're incredibly happy with it. But, in the event you're happy with it, but feel like it's missing a little something, that little something may be one of our gorgeous landscape rocks. Once you find the large landscape rock you're looking for we can deliver and place it exactly where you want. That's no easy task either as some of our largest rocks can weigh several tons. For water features such as pond accents and mini cliffs for a waterfall feature. 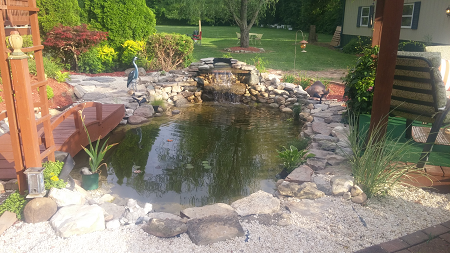 Do you have a pond at your place? Is there a spillway or other overflow that you have small stone but the stones keep washing away? 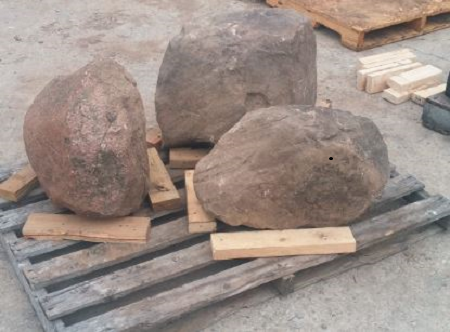 Our large rocks can be used to be keep the stones in place and be used as part of the spillway or overflow. They can also be used as a beautiful steps in a waterfall (like the picture at the very top of this page). Ask us how we can turn our large stones into your waterfall. It'll be the landscape feature everyone in the neighborhood will be talking about. They can be used as benches around a campfire. Have you got a nice area for a campfire, but every time you invite family and friends over, they have to bring their own chairs? Wouldn't it be nice if you had ready made seats and chairs already there that you never had to take care of? Wouldn't it be great if those seats looked great and fit in well with your landscape and looked just as natural as your fireplace area? If so, give is a call wherever you are in Ohio! Retaining walls. Do you have a fairly steep graded area on your property? Has it been a pain in the rear to maintain? If so, have you considered a retaining wall? Now, there are many solutions for a retaining wall and many of them look awesome, so there are plenty of options available. I'm guessing you may not have considered the best boulders in Ohio? Why not? We can do the same thing with far few boulders and it will look absolutely fantastic. They can be bored thru and used as a landscape fountain. Turning your beautiful boulders into gorgeous fountains and other water features is a specialty of ours. We take great pride in the finished product and have the expertise to make it look out of this world. So how do we do it? We take the Ohio boulder of your choosing and understand where the best flat spot is for it to sit. Then we'll use our special boring equipment to bore a hole into the rock. At that point we'll deliver the rock and if needed use our crane to place it exactly where it needs to be. We'll then attach the pump to the rock, fill the pond, and turn it on. All there is for you to do is take in the beauty and listen to the calming water flow over the rock. This is our favorite service to provide. Engraved with your company name, your family name, or whatever else you'd like. Do you own a business and need a sign? Why not use one of our large Ohio boulders and engrave your company name in it? It's guaranteed to be one of the most unique pieces of signage on the block and will be a conversation starter for many of your potential customers. Do you live on the corner and have been trying to find a way to spice up the landscaping in that area of the yard? 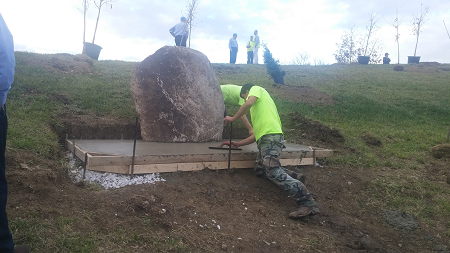 Please consider using one of our Ohio landscape boulders and engraving your family name on it. You'll instantly bump up your curb appeal and will be the envy of the neighborhood. 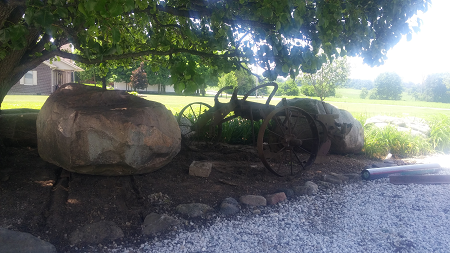 You'll have the best looking corner landscape in the neighborhood.... and when people ask you where you got the boulder, please tell them Notestine's Farm and Boulder, the top boulder company in Ohio! We'll quote delivery on any job. But if you live in far northeast Ohio, it may be more expensive than you'd prefer. We're located outside of New Carlisle, Ohio. So we're centered in west central Ohio and have good reach across the state. 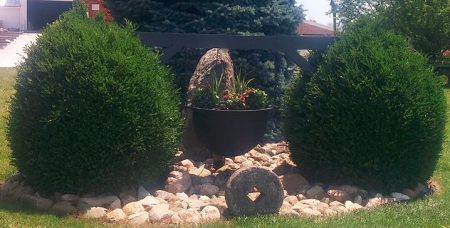 Our delivery includes setting the boulder wherever you'd like and if you ordered a boulder fountain, we'll set that up too. Prices are set by the size and the number of boulders purchased. Give us a call if you're looking to turn your boulder into a fountain or etch it as well. We quote those individually as each job is so different. We're outside of New Carlisle, Ohio about 30 minutes northeast of Dayton. We're also less than an hour to both Columbus and Cincinnati. Contact us today for a free estimate!